WataugaWatch: Jonathan Jordan Sez: "What I'm Doing in Raleigh on a Daily Basis Is Confidential"
Jonathan Jordan Sez: "What I'm Doing in Raleigh on a Daily Basis Is Confidential"
In an article detailing how much the two-month delay in agreeing to a state budget is costing North Carolina taxpayers, WBTV in Charlotte asked Jonathan Jordan to account for his activities during those two months, for which he's paid $104-a-day. According to WBTV, Jordan "refused to provide details" of what he's doing on a daily basis (since he's not part of the budget-writing team in the House). "Jordan went so far as to refuse an interview request to discuss what he does in Raleigh on a daily basis because, he said, that information is confidential." Transparency and accountability? Not from Representative Jonathan Jordan. Link to WBTV article has been added above. He may be eating. Leave Bluto alone. I think I'd be careful, yeah sure! The man's a veteran of both the Navy and the Army and an Iraq veteran, and he looks a lot more capable than Mr. Jordan. Yeah Sure - I'm not just campaigning on the liberal blog. Launched the new website last week and I am just starting to be public in my campaign. I'm reaching out and interacting with organizations and groups all around the area. I find going to a local blog....liberal or conservative is a good way of learning what people are talking about and care about. If elected I will be representing everyone...not just people with an R by their name. So, doesn't it make sense to interact and understand all points of view? My personal cell phone number, email address...etc are on my website. Send me a text, call, or email. I'm willing to get together with anyone regardless of party affiliation. Oh Suzannah - Thanks for the plug!! Lew Hendricks...Thanks, but I think I will leave you and your liberal friends to continue by yourselves. My Republican friends and I will support the conservative REPUBLICAN that we have elected to the last 3 terms. In the meantime, you and the lefties can play your games. Oh, Suzannah. So, are you planning on switching parties to vote for him? Democrats don't seem to ba able to find a candidate that can win - maybe you will have better luck getting behind a different "Reublican". Yeah, that's not a bad idea! Thanks for the tip. Great! Well, that's one vote. Probably with the good folks at the watauga watch blog behind him, he will get even more! Just watched his video intro....Hendricks probably is better than Jordan--he's certainly in better physical shape--picture a true race between the two! But "running" on his war record and the typical campaign promise about representing all the people of his district is not enough to satisfy this Democrat. True, our farbling Dems don't seem to be able to put a winner up (if that great, hardworking, super-qualified candidate Sue Counts couldn't win, we may be stuck for at least the rest of the decade with a GOPer to represent "us" in Raleigh). Would a GOPer newbie do a better job? Guess I must know a lot more before I change my resigration to vote in their primary. 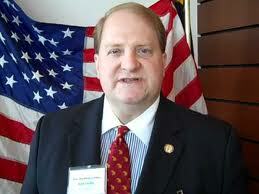 For example--is this guy a Franklin Graham clone/Samaritan's Purse stooge, like our House rep? Does he have a real job? Where does he stand on supporting public ed or do those cute kids of his get homeschooled? Can he campaign credibly among the constituency of ASU students/staff/faculty, which respresents such a large voting bloc despite the continuing efforts of our BOE majority to disfranchise them? Valid points, of course, Brother Doc. I changed to Unaffiliated years ago to vote against V. Foxx in a primary, and I'd be only too happy to do something similar again. Brother Doc,can we count on your support? He looks like the kind of carpetbagging liberal you would get behind. A year ago he was voting in Chapel Hill but has now deigned to give us mountain folk a bit of progressive leadership. Probably he will do well with the ASU crowd. There are bund to be 50 or 60 Republicans in that bunch! Sue Counts was a very popular and very qualified candidate. She worked extremely hare and cannot be faulted for the loss. I attribute Jordan's win to the poor campaign strategy that the Counts campaign put together. Yeah Sure - Now I like facts without any context just as much as the next guy, but let me shed some light. When I joined the Army in 2007 or when anyone joins the military you have a "Home Of Record" (HOR). Because I and most other military members move around so much it is easier if you maintain the same HOR throughout your career. During my time in the military I lived in Georgia, Virginia, Iraq for a year, and North Carolina (3 different locations). When I joined the Army my HOR was Chapel Hill and it stayed that way until I got out in 2014. After returning to civilian life, last year, I finally changed my HOR to Watauga County. Brother Doc - Great questions. If I try to answer all of them here it will lead to more questions. Maybe you and some of your friends and I can coordinate a time and place where we can discuss these questions. I am trying to get in front of as many people as possible regardless of party affiliation to understand concerns and answer any questions people may have. Shoot me a text, phone call, or email below. Lew, I sincerely appreciate your reaching out and I am going to be in touch with you. Looking further at your website and where you stand on education, I like what you say. I think you will find your views resonating across party lines on that topic. And for those who don't think Sue had a very good campaign strategy last year, I would simply beg to differ, I observed some facets of her campaign close up and don't know how much more she could have done. That's behind us now, however. We need to break the ideological stranglehold in Raleigh and change agents must emerge. Brother Doc....Sue did all she could have done. She worked tirelessly every day in both Ashe and Watauga Counties. You MAY, as you said, have seen "some aspects" of her campaign close up but you obviously aren't aware of some of the decisions made in prepping her for debates; press availability; prepared statements, etc. As I said, amateur night! She would have won with better guidance. Regarding Jordan, let's not forget this is the same sleazebag who caters to the worst in us. Any remember the Cullie in a sombrero ad? Or the out and out disgusting racist flyer with the demonic looking William barber and his flag pin photoshopped off standing behind grinning Sue Counts? But hey if it wins you the Boonies and the "That (you know what word) Obummer is a MOOSLIM! crowd" why not right? All I can say is good Luck Lew, not just because of a desire to see Jordan on the curb where his behind belongs. But good luck to trying to restore even a glimmer of sanity to a Republican party so far out in the weeds (or kowtowing to the Franklin Graham and Donald Trump's of the world) that having a rational debate with them is impossible. If you can get past your own party's intransigence and crazytown (Or as I call it also, watauga watch) you're already one step ahead of the game. Jesse Steele-the flyers and mailings you're referring to came out of Raleigh. They were funded by the Koch brothers through Art Pope. Several of those bigoted, hate-filled flyers and mailings weren't even seen by the clown candidates until they were in mailboxes. The campaign for these puppets basically was done with the candidates only standing on the X. The best one was the TV ad: "luxury fishing pier".......which is part of the NC Aquarium and paid for by user fees. Passed the legislature with only one or two dissenting votes, (if I remember correctly). and was used against Demo candidates in virtually every district. Jeff: pork is pork if its paid for with public funds. Brother DOC: So you think Samaritan's Purse supports a bunch of "stooges?" I know my daughter and her husband volunteer to help Samaritan's Purse in some of their charitable activities. I suspect those who benefit from their charity do not view them as "stooges." Do you have a bias against good samaritans? Retro-you TOTALLY miss the point. The NC Aquarium fishing pier is hardly "pork." The legislature-both Demos and Repubs approved the project with one or two dissenting votes. The bond is being paid off by user fees-just like many other projects in the state. The TV spots against Cullie and Steve-and about seventy other candidates across the state IMPLIED that the pier was a Democratic "give-away" when the wast majority of Republicans also voted in favor. It's just typical Repug lying because that's the only way they can get elected-oh, and serious gerrymandering. Democratic candidates across the state got 150,000 more votes across the state than Republicans. If you want to answer this with Democratic gerrymandering in the past, go ahead. But, there has never been this wide a gap in voter wishes and results. Jeff, Your political history of recent NC elections is somewhat skewed. Republicans took control of the General Assembly in 2011 after the 2010 elections under districts gerrymandered by Democrats who were in total control of state government for many years. By 2010 voters were fed up with Democrat pork barrel spending, corruption and cronyism. The fishing pier was symbolic to voters of Democrat abuse of power through profligate public spending and higher taxes. And as long as Democrat voters are concentrated in central cities while Republicans and independent voters are widely disbursed throughout most of the state, the GOP will continue to control the state legislature. And if there are more Democrat voters statewide as you suggest, I guess Thom Tillis, who just got elected as our senator in a statewide election, must have closed that "gap in voter wishes and results." Look who Tillis was running against. You could probably have won-well, probably not. Remember the Republican mantra: if you tell the same lies enough times quite a few people will accept the lies as being the truth. Tillis ran against an incumbent Democrat senator who was leading in all the polls up until election day. She, and PACs on her behalf, outspent Tillis. You can't blame the loss on your boogie man "gerrymandering", so now you are taking the position that your sitting senator was not a strong candidate? There were polls which were correct in this race. Virtually all her money came from bankers and Wall Street. I'm a Democrat and couldn't vote for this Republican, (excuse me, anti-American middle class, bought and paid for), Democrat. So then, are you saying that you judge the viability of this candidate based on the fact that YOU didn't vote for her? You do realize (I HOPE) that, in spite of the fact that YOU didn't like her, she was a strong candidate?